CA Translation Services is an English-Spanish boutique translation firm. They focus primarily on legal, business and marketing translations (like product labels, company manuals, etc). Having been our clients for the last 7 years, we've managed their online marketing successfully and established a relationship of trust. This time, they wanted to refresh the brand (new logo, brochures, card, the works) and keep their web design we made for them last time as much as possible. The team at SearchEngineOp worked with Canamar Amaya to create a new image for CA Translation Services. CA Translation's brand is designed to generate trust and evoke an institutional feeling. A sense of tradition that combines with modernity is important to show the agency remains loyal to its roots while keeping a modern approach to business. Typography has an important role to play and a serif font was chosen as it conveys a sense of tradition and institution. The extra blemishes on the characters show a forward looking attitude that stays true to its past. A translation firm website must appeal to lawyers, physiotherapists, insurance companies and government employees, a very diverse group. 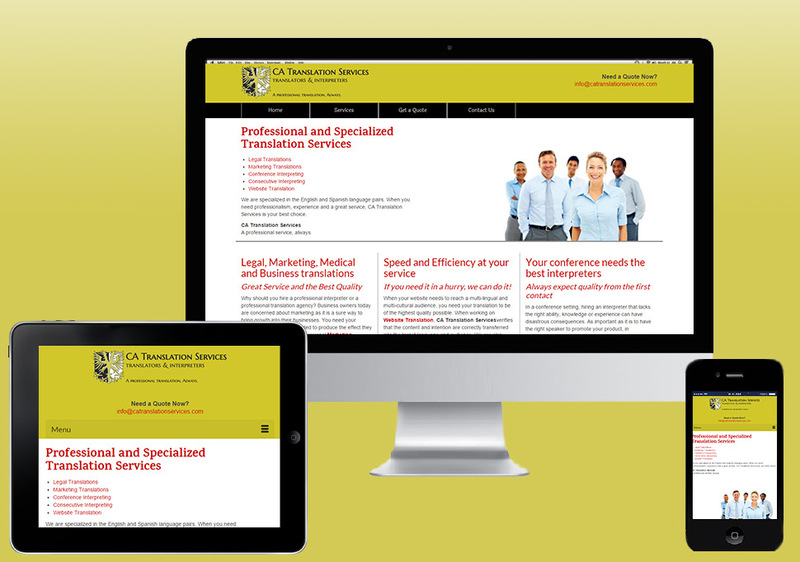 CA Translation has enjoyed excellent ranking of their website for several years and it was very important that after the launch we could minimize the adjustment that typically happens when a website is redesigned and restructured. After considering the different elements of the project, we developed a customized relaunch strategy and a design that would be pleasing and attractive to the different client profiles being targeted. Most importantly, the website has to show their professionalism and efficiency, as these have been their differentiating factors and why their clients keep coming back. The result is a beautiful and clean web design that showcases the company and its services while maintaining / improving its ranking. A responsive design that works on desktops, cellphones and tablets and is professional and easy to navigate. Thank you for all the work you do for us. Our long standing relationship has been a very successful one and look forward to many more years of success with you as our marketing team.